I have now finished the second installment in the Slayers franchise. The previous title managed to be a pretty good anime as it was a pretty unique title with a main character who wasn’t afraid to deal with collateral damage. The concept may not seem unique to older anime viewers, but there aren’t many fantasy titles that take place in the olden days like this one anymore so it was pretty fresh for me. Slayers Next definitely takes most of the aspects from the first show and brings them to new heights. This works as a double edged blade, but it is definitely another anime worth watching. 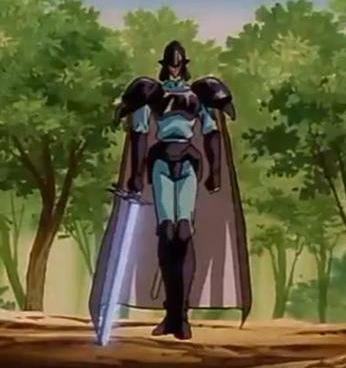 The series takes place shortly after the climax of the series finale as Lina and Gourry have split up from the rest of the party. They seem to just be wandering around without much of a goal, but they meet up with Amelia and Zelgadis. Zelgadis still wants to be turned back into a human so he is working for some corrupt dealers. Lina quickly sets him straight and the 4 heroes decide to search for some manuscripts to the Claire Bible. The Claire Bible is supposed to have unlimited knowledge so that should help Zelgadis in his quest. This artifact becomes more and more crucial to their quest as some strong monsters start showing up to destroy Lina. Lina Inverse begins to suspect why they are after her and let’s just say that there are some planetary ramifications involved. The heroes are going to have to grow even stronger if they want to counter this new threat. Now, you can argue that the Claire Bible arc is the entire show or you can divide it up by having the search for it be the first half while the battle against the monsters is the second half. It’s debatable I suppose, but it’s really just all one arc in my mind. A mysterious figure by the name of Xellos helps to distinguish these parts as he leads them on a lot of wild (filler) goose chases to various parts of the planet in the first half of the series. Also, we can’t forget that this is still Slayers. There are quite a few filler episodes where the cast gets to help liberate kingdoms and solve mysteries as they take a break from the serious dealings with the monsters. Sometimes, a filler episode will even squeeze in a moment or two to add some details to the real plot as they go on their journey. The series is still pretty light as with the first title with only a quick scene or two where the violence gets ramped up. It never goes overboard as the show keeps it real and that makes the scenes even more surprising. As with the first show, this only occurs at the very end when the climax starts. The body count begins to rise and you can tell that the main villains mean business. Slayers does a good job of knowing when to get serious and when to keep the mood happy and light. I also have to give the writers credit for their depiction of Lina Inverse. It would have been easy to pull a 1st Hokage or Goku/Gohan where they are always very nice, but instantly become feared amongst their allies when they get serious. I never liked that aspect of a character since it’s okay to intimidate a villain, but your allies shouldn’t fear you. Doesn’t that basically just make you the next villain? Lina’s pals never fear her except for comic relief scenes where they back away. That’s more acceptable since it’s just for laughs anyway and you can tell that they aren’t serious. Sadly, the anime does use Lina as an excuse for some fanservice now and again. (For once, I wouldn’t actually blame Lina’s character for it since it’s usually people insulting her, which is hardly her fault) It’s not drastic since Lina’s character is meant to purposely not be able to give us a lot of fanservice so it’s mostly just a lot of chest comments from villains that Lina quickly decimates. Martina is usually the one who initiates this and she also gives us some more fanservice. I’d say that Next definitely has more of this overall than the first season, but it’s still reasonably light compared to most shows. As mentioned, the fanservice is mostly audio based as opposed to the standard visual. (There’s only one or two hot spring scenes that would beg to differ) I’d say that this is preferable, but they are naturally both uncalled for and I’m just glad that they aren’t heavily featured here. It should be noted that there are some brief romance elements to be found here. From the parody Sylphiel to the filler princes, Slayers Next does include a bit of it. The final episode also has a quick moment, but luckily the characters realized that they just panicked and pretended that the whole thing never happened. Forget and Forget is their motto and it worked pretty well. Gourry is about as likable as he was in the first show. This means that he is a great character 90% of the time, but he still can’t help, but make insulting remarks about Lina’s chest, which quickly drops him down as a character. To be a truly good character, you must be good at least 99% of the time. Gourry is always a little slow on the ball when it comes to just about anything, but it arguably gets even worse in Slayers Next for him. A scene that captures his personality perfectly is when the heroes go to the hot springs. Gourry takes so long to change out of his clothes that everyone is already leaving when he’s getting there. He tries to tell Zelgadis to wait up since he was just about to go in, but he doesn’t listen so Gourry is forced to enjoy the hot springs by himself. It’s hard to tell whether you should cry or laugh since it’s just so sad for the guy. You also have to wonder how long it took him to change since you’d think that the heroes had already been in the hot springs for a while. Zelgadis has certainly changed a lot since his days in the original series. He’s totally used for comedy now and he’s barely serious at all. He’s also shown to be significantly weaker than Lina at this point so he can’t really help when it comes down to a fight. Ironically, he did get a cool new sword, but it’s no Sword of Light and the villains tend to be too fast for him. All of this doesn’t bode too well for him, but you could argue that these developments were not downright terrible for him. No, the worst part is that Zelgadis completely turns against his friends just because he believes that someone can cure him. He betrays them without a second thought even though he knows that he’s working for an evil person. I have to admit that this was going pretty far and while he may have joined up with Lina’s team on good terms by the end…it was a little too late for him. He just went way too far in his quest. Xellos is easily one of the worst characters in the series. He’s played off as a mysterious fighter who is also incredibly strong, but it worked better for Blues. (Proto Man) Xellos has an extremely nasal voice to continue the franchise’s interesting ensemble of voices, but it’s not enough to make him likable. He likes to troll the heroes, which isn’t terrible in itself, but he does it in an evil way. You can tell that he’s a villain, but the anime tries to play it off like he’s just above such disputes. He humiliates Zelgadis and typically just gets the heroes into trouble, but they still allow him to tag along on the journey. He also makes random romantic advances to keep people quiet, which also makes him pretty tedious. He has a few twists and we discover just how powerful he is, but he still manages to look terrible. After all of the hype, he can barely take on a minion (He needs Lina’s help) and he gets utterly wrecked by the first real villain that he encounters. Sure, he took on an army in a flashback, but flashbacks are like banana peels. They used to be good and now they’ve just spoiled our image of what things could have been. whenever Xellos appeared, I would hope that someone would take him out. The heroes never really tried to do anything about him so it was up to the other villains. Amelia has stayed pretty true to form in this sequel. As with Gourry and Lina, she really hasn’t changed at all and that’s a good thing. The first episode was a change of pace since she seemed to be more confident in her role as a princess as well as her combat abilities. She may be a little more aggressive and eager to fight here, which can only help her character. She is still a hero of justice and Amelia is easily the most heroic member of the party. (Gourry may be a close second, but Amelia really just wants to help people out. It doesn’t get more heroic than that!) She is the first fighter to finally enhance her hand to hand skills with spirit energy, which is a classic Shonen technique. She can’t really match up against the villains so she is forced to watch on the sidelines with Sylphiel and Zelgadis for the majority of the series. Her determination is simply not enough to close the gap, but she’s still a pretty great character. Martina has quickly become one of the main characters of the series, but she’s only good in a parodyish way. Sometimes it can be hard not to root for her to defeat Lina so that she can finally have a win, but usually you are just hoping that she will go away. She crushes on people pretty quickly and she worships a made up monster that she thought up during her desperate hours. I do admire the fact that she is always going after Lina, whether it means going through a den of monsters or burning one of the Claire Bible manuscripts. I think the series should think twice before making her a permanent member of the team, but she’s still better than some of the party members that we’ve seen in other series. I have to wonder what happened to Sylphiel. I’m thinking that the writers must have forgotten about her and how skilled she looked in her debut in the original series. Sylphiel started out her anime history by blocking one of Rezo’s ultimate blasts with a barrier. Not even Lina and Zelgadis’ combined efforts were enough to block this, yet Sylphiel stopped the blast with ease. After that, she has never managed to pull off a decent magic feat again. For most of this series, she just provides the heroes with moral support. Sylphiel does get one good moment where we find out that she knows how to use the Dragon Slave (City Buster) attack, which was a great improvement, but her other abilities are still below average. She is mainly a healer and it seems like she will be sticking to that. I think the writers dropped the ball here since she could have been the ultimate defense fighter with her powerful barriers and healing magic. She’s still a decent character, but she’s probably a little less likable than she could have been. Also, she says “Dear Gourry” instead of “Gourry dear” in this show a lot. I guess it’s because Gourry isn’t usually around, but it’s hard to get used too. She means well, but I’m not sure what she can really bring to the table when a fight draws near. Lina has some healing magic to use in a pinch as well. Gaav is one of the big villains in this series and he’s pretty great. He’s a villain who relies on his physical attributes while also utilizing his energy blasts. Think of him as an evil Goku and you’ll have the right idea. He’s easily the best villain in the franchise so far and I don’t see him dropping anytime soon. He doesn’t appear until the series is almost over, but he makes his presence known. His end is pretty unsatisfying, but I think it was better than some of the alternate ways that the show could have gone about it. The Lord of Nightmares is a supremely powerful being who is capable of doing just about anything. She is above all of the other cosmic beings so she can be used as a Deux Ex Machina whenever the need arises. She is known to be a really evil and dangerous figure by reputation, but we find out that she’s not really a bad person. She blows up galaxies and star systems, but she doesn’t do it for any petty reasons. It’s just the natural cycle of life. She will alter her plans if she wishes to do so. She gets a bit of a role in the climax and I was glad that she lived up to the hype. I doubt we’ll ever get to see her seriously fight since it would be impossible for another fighter to match her, but I’ll take this over nothing. She’s easily one of the better cosmic beings since she is at least a reasonable person and she doesn’t drone on about how we can’t change the inevitable. Phibrizzo is the final villain of the series and he’s definitely a force to be reckoned with. His true form seems like it would have been cool, but we don’t really get to see it in action. Phibrizzo makes the intriguing decision to fight the heroes as a little kid and I can’t say that I appreciate the gesture. This means that we can’t really look forward to any close combat situations with him. He likes to terminate his opponents from afar by simply willing it to be. He has power over death, which makes him very powerful, but not very fun to watch. I didn’t like him as a villain from the get go. As I mentioned, he’s very tough, but that doesn’t make him likable. As far as final bosses go, Slayers could do better. If only Gaav had been the final antagonist..now he was a villain! Kanzel and Magenta are two of the monsters who challenged Lina and her friends during one of the mini arcs. They were actually relevant to the plot by the end since they had orders to get Lina, but their episodes tended to feel like filler. No matter, these guys were pretty tough and especially Kanzel. Both of them could have easily defeated Lina’s group if they had fought seriously from the beginning. The battle with Kanzel was pretty fun to watch since he could spam his teleporting ability and his defensive capabilities were unbelievable. He was able to take on a Ragna Blade and a Dragon Slave. His design is also pretty great when he enters his super form. Both of these villains were actually pretty likable and I would take them over Phibrizzo. Halciform is a villain who gets a pretty minor role, but his immortality gives him a fighting chance against Lina. I always felt like anime writers gave immortality a little too much credit. Even if a villain is immortal, they are still vulnerable unless they have instant regeneration. At one point, Gourry slashes Halciform, which destroys him until he regenerates. It takes him a few seconds and they could have gone for a more serious injury that would have slowed him down some more. He also has some magic spells, but it’s nothing that will really be able to take Lina down. I didn’t find Halciform to be that likable, but he was a decent threat as far as one shot villains go. 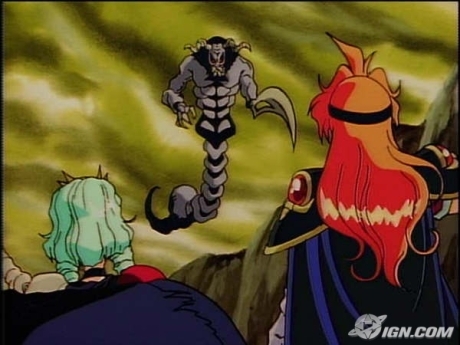 Zangulus only gets to appear briefly for about 2-3 episodes, but he arrives at a pretty crucial moment. 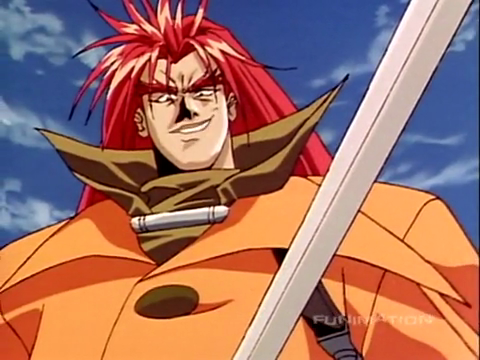 He looks pretty good here as he just wants to fight Gourry and he’s more of a rival than a villain now. He doesn’t resort to cheap tricks and he just wants to have a fair one on one fight. I can’t say that I really cared for him in the previous show, but he’s much better here. It can be a little hard to take him seriously since he’s outclassed powerwise, but he still puts up a good effort. His sword certainly comes in handy as well. His screentime may be limited, but Zangulus certainly makes the most out of it. Seigram is actually one of the biggest villains in the show. He’s technically just a minion to Gaav, but his abilities speak for themselves. He was strong enough to give Zellos a good fight and he was also outclassing Lina and her friends. It’s hard to land a hit against him since he’s constantly teleporting. It’s sort of like Tobi’s trick from Naruto. He’s a cunning and resourceful villain and I became a fan by the end. He reminds me of The Other from Avengers. He has a cool mask and epic powers so that’s basically all that I needed from him. He’ll probably just be known as one of the more obscure villains as the franchise goes on without him, but he was pretty cool. The animation is also a noticeable step up from the first show. Some episodes may look a little bit like the original, but the climax as well as the first episodes can really show you how the animation has advanced. The colors are a lot brighter/sharper and JC Staff has once again showed us that they are ahead of the curve. Mixing that in with the DBZ effects just makes it incredibly enjoyable to behold. Slayers is able to keep that 90’s feel while bringing in some animation that looks like it’s in the latter 2000’s era. One area that could come back to bite Slayers are the power levels in the series. Lina continues to learn new spells, but physically she is still just a human. This affects the whole cast since it doesn’t matter how much they train their offensive capabilities if their speed and durability to not improve. As it stands, the heroes get nervous whenever a monster shows up. If a normal monster can give them a good fight, then it’s even harder to see how they can stand up to the higher ups. They were lucky that Phibrizzo decided to take their ultimate attack and that the Lord of Nightmares found the heroes intriguing because things could have gotten very dangerous otherwise. Lina’s attacks deal damage over a pretty wide area, but that’s still not going to cut it against enemies who move at high speeds. We saw Zellos take on one of the commanders in a hyper speed battle and Lina’s group couldn’t even see them half of the time. The heroes simply wouldn’t stand a chance and the opponent wasn’t even one of the high ranking villains. This series certainly had a decent amount of plot hax, but it wasn’t spectacularly obvious. All shows have some plot hax to a degree, but it’s all about minimizing these scenes. Slayers definitely deserves a lot of credit for the character roster. We have some pretty likable heroes and villains. Since the show lacks some of the advantages that other titles have, it has to make up for it with strong writing and solid characters. (For example, Sword Art Online started out with a huge budget, top notch voice actors, and an amazing soundtrack. Slayers has to start off without any of that) The voices are still a little retro in an unintentional way, but they can make the characters a little more humorous as well. One way to tell whether the characters are really good or not is to pay attention to the filler episodes. There are plenty of them to be found here (Dragon Fishing, Tennis matches, mysteries, etc) and a filler episode can hold up well if the characters as good. If they’re boring or can’t hold their own episodes with a bad plot, (Like Naruto and DBZ without the Saiyans) then they may not be as good as you think. Some of the filler episodes weren’t that good, but the characters always stayed in character and they weren’t as bad as the filler that I am used too. Overall, Slayers Next is a pretty solid show. I’d basically say that it’s the very definition of a good/fun anime. It was slightly better than the first show, but it’s pretty close. This one had more action, but some of the filler episodes as well as Xellos’ character as a whole kept this from being a stomp. That being said, we’ve moved away from the days of the random mobs and monsters as real threats are always around now. Slayers Next also had a little more fanservice humor, but it was not overdone, which was a very good thing. The soundtrack can hold its own and the animation has improved. As long as Lina and Gourry are the two main characters, we can look forward to fun episodes since they can really hold their own stories. Their interactions are always fun and the voice acting keeps you entertained. I recommend this title to all fantasy fans and viewers who want to see a traditional RPG styled title. 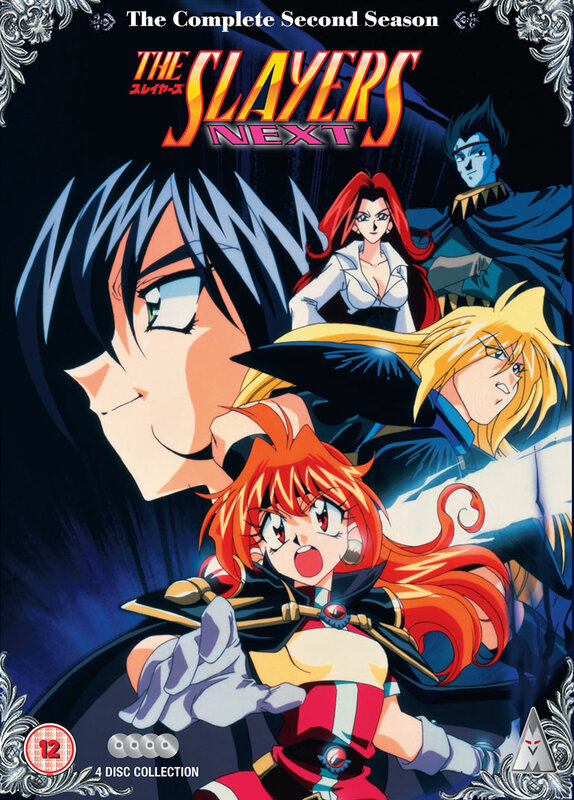 This entry was posted in 7 Star TV Shows, Reviews, TV Show Reviews, TV Shows and tagged Anime Review, Fantasy, Fujimi Shobo, Gourry, Lina Inverse, Review, RPG, Slayers, TV Show Review by dreager1. Bookmark the permalink.